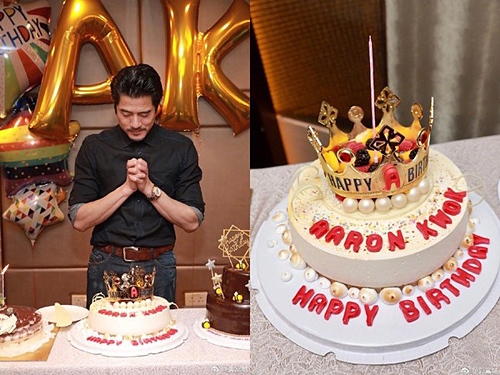 Celebrating his 53rd birthday on October 26, Aaron Kwok (郭富城) held a small dinner celebration which was attended by close friends and family. 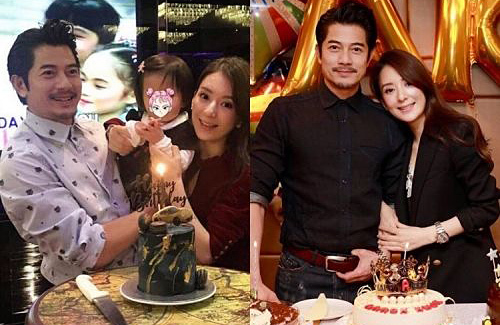 Guests such as Chilam Cheung (張智霖) gave their well wishes, while Aaron later shared a Weibo post of wife Moka Fang (方媛) standing by his side as he blew out the candles on his birthday cakes. Dressed in matching black with his wife, it was a sweet moment for Aaron as he lowered his head with hands clasped and made his birthday wish alongside Moka. One of the four ‘’Heavenly Kings” of Hong Kong, the superstar had ignited public fervor in 2015 when he declared his romance with Moka by posting a photo showing the two of them holding hands. The couple’s 23-year-old age gap had set off heated discussions. There was even a period when Aaron’s frequent updates of lovey-dovey photos with Moka, a Mainland Chinese model, irked fans so much that the superstar took to declare that he would then stop posting any more such photos, and that he hoped to be able to resume normalcy by keeping the public limelight on him separate from his personal love life. The couple welcomed their daughter last year. While Moka is reportedly pregnant with their second child, Aaron only thanked the media for their concern and said he would certainly share good news if there were any. Wearing a loose blazer at Aaron’s birthday party, Moka seemed to be intentionally hiding a baby bump. Nevertheless, with an upcoming world tour and his happily married life, it seems that Aaron has it all. Netizens are now complementing him on his twin achievements of career success and marital bliss with his pretty wife.